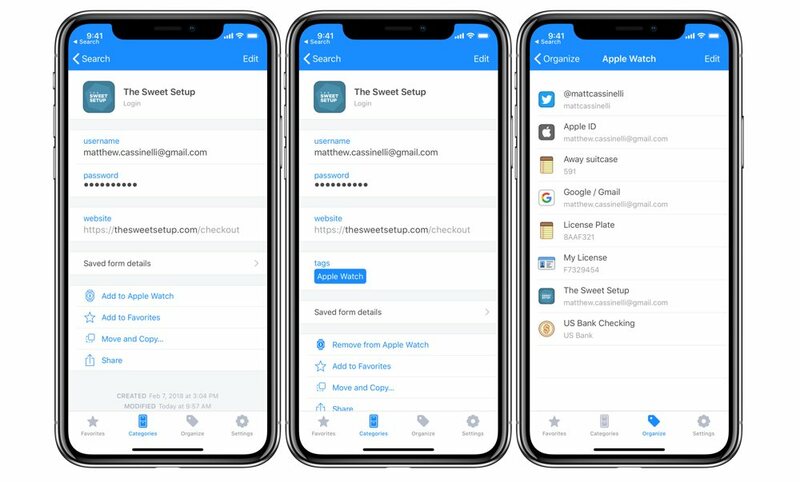 I’ve been a fan of 1Password for years, originally diving into the app to manage all of the social logins for my clients when I worked at an advertising agency. Since then, it’s proven to be invaluable for keeping my passwords secure, being a long-term repository for important information, and making it much easier to fill out forms on my Mac and iOS devices. But one particular part of the services has a special place in my heart – 1Password for Apple Watch. 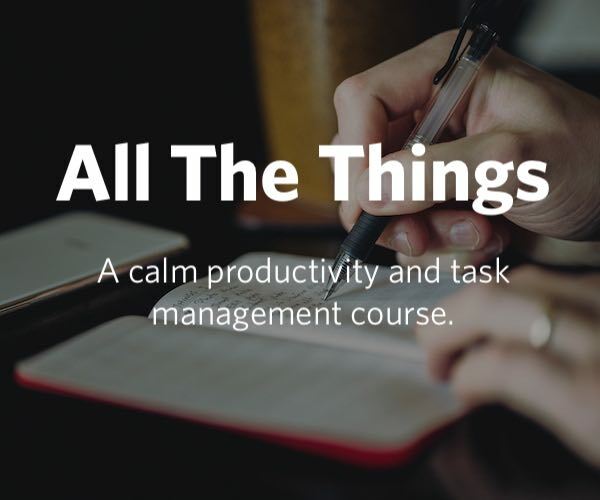 This super handy little app is one of the few that I open and use regularly from my wrist, giving me quick access to important information while staying secure. Plus, it alleviates one of the only problems I have with using 1Password (and extra security in general) – getting my information without interrupting my workflow. One of the only frustrations I have encountered with the iOS app is that sometimes it’s almost too secure – every time I open it or accidentally swipe to it in multitasking, I’m interrupted by the unlock mechanism. On iPhone X, if I’m swiping between apps, I’ll be stopped as it tries to scan my face with FaceID or on iPad it throws up a Touch ID prompt. 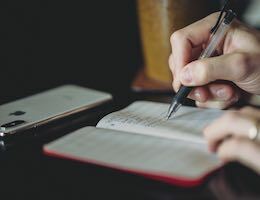 This minor step often breaks the flow of progress — and also nags at me a bit — so now when it keeps occurring, I sometimes find myself annoyed as it happens again. But with the Apple Watch version, the app just opens — it was already authenticated when the watch itself was unlocked. Since the Apple Watch stays unlocked as long as the watch is in contact with my skin, 1Password knows I’m the same user and doesn’t need my permission each time to show login items each time. I also haven’t keep all of these on my Apple Watch at all times – I just add them when I need them, like when I’m traveling or if I’m cleaning up one weekend. One of the other major benefits of having 1Password open immediately without entering your passcode is that it makes it even faster when you use Siri to open the watch app. Saying “Hey Siri open 1Password to my wrist” will take me right to my list, which then stays open for a few minutes as long as I don’t do anything else on my watch. Plus, you won’t even need Hey Siri once Raise to Speak launches with watchOS 5. When I don’t use Siri, I have the 1Password app stored in my Apple Watch dock so I can open it from there by pressing the side button and tapping in. Plus, it’s very quick to get to 1Password if you use the List View of apps instead of the Grid View on the Apple Watch – just Force Press on the app screen and switch views, then 1Password is always right at the top of the list thanks to alphabetical sorting. 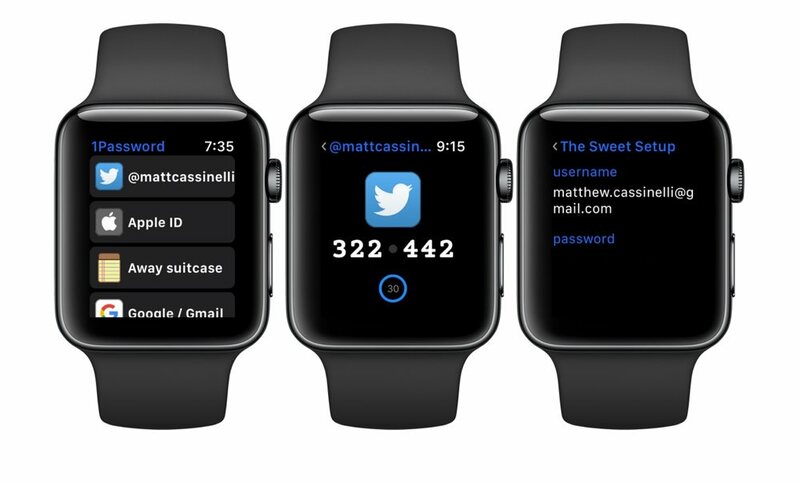 In 1Password 7, you’ll have to unlock the Pro features to get access to the Apple Watch app. Then, go into Settings and find Apple Watch (just under 1Password Browser), and toggle on the Enable Apple Watch option. The developers have linked to an article covering the security implications of keeping your passwords synced on your wrist – in short, they’re not locked by your master password and in theory could be remotely accessed from your watch while your phone is locked (because… that’s how you use it). But it’s worth considering – they don’t recommend bank logins or emails (like I’ve done). 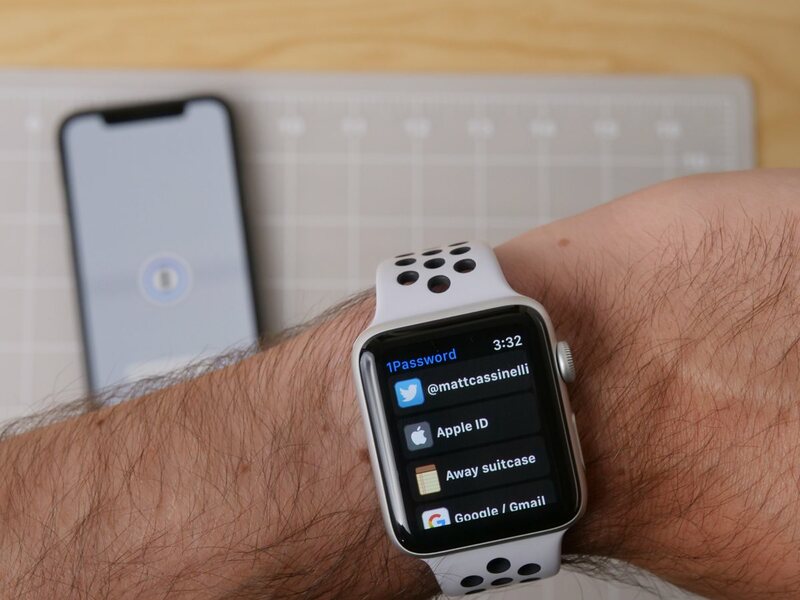 In order to set up a login or other item from 1Password onto the Apple Watch app, tap into the item detail view and look for the Add To Apple Watch button at the top of a series of actions (above Add to Favorites, Move and Copy, and Share). Tapping this applies an Apple Watch tag to the login item, and you can tap Remove from Apple Watch to get rid of the tag later. Tapping on the Apple Watch tag also takes you to the list view of all the items added to your watch. Later, once you have added more, this is a helpful view for managing what you want to see on your wrist – you can also back to this view in the Organize tab in the 1Password app, where it’s located alongside your other tag groups. Once you’ve added your items, they’ll sync to 1Password almost immediately – their app is very lightweight, so the data transfers quickly. This makes using the app in a more fluid way as I have much more realistic – many Apple Watch apps simply take too long to sync and ruin the experience of moving from your phone to the wrist quickly. 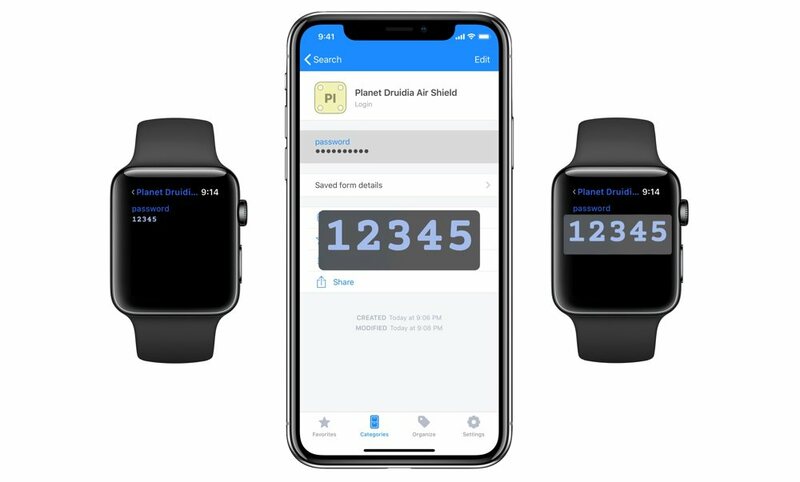 1Password’s Apple Watch app shows a simple view of the items you’ve added – when you tap on one, it opens the detail view where you can see the name, password, or other information. This itself is another great benefit – sometimes you may remember your password and can enter it on the fly, but if you have extra security set up (which you should) it removes some of the friction of entering a second generated passcode. Curiously, they only show the 2-factor code – you can’t see the password for these items. It seems they assume you remember the main password and just want to use it for the extra authentication – in practice, it’s odd to have a mix of actual passwords and then some code-only ones on the watch app. If possible, I’d like to be able to see both. Maybe you could swipe/scroll down with the Digital Crown to see the login, or use Force Touch to switch views. And while I understand the general security concerns when you’re in a public place with your Mac, your watch is often not very exposed to other people – it’d be nice to see your logins in a bit bigger text than what’s currently shown in the display view. It’d be great if they could show up on the Siri watch face if you’ve recently entered in a password or use the same passwords at similar times; or, perhaps being able to securely associate a location with a password could provide additional contexts so 1Password could let Siri know when/where to surface the shortcut. 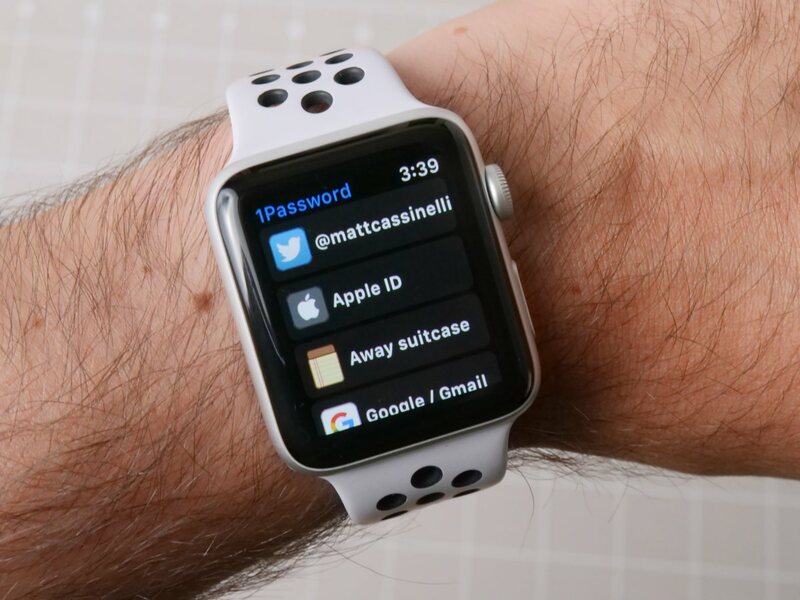 I’ll continue to use this alongside the main apps on iPhone, iPad, and my Mac to keep my login life easy and pain-free – plus it’s honestly just super cool to have secret passwords on your wrist sometimes.